The 2012 vintage with its warm ripening period for Chardonnay has produced a fine and elegant wine, displaying the hallmark flavours of lemon pith and grapefruit with hints of pear and white stone fruit. Sensitive winemaking techniques have resulted in a lower alcohol style wine that is restrained, complex and elegant. 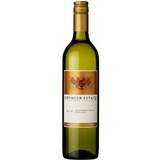 This is a classic Margaret River Chardonnay that will reward you now or in years to come. NOSE: Complex aromas of citrus fruit and pear with delicate floral nuances and underlying flinty notes. PALATE: The textural palate displays fresh and vibrant citrus fruits in the lime, lemon pith and grapefruit spectrum with an attractive savoury element, finishing with a clean flinty, mineral edge. GOES WELL WITH: Roasted spatchcock, spring flower salad, baby radish, lemon thyme essence.